FieldView 15.1 is now available and includes surface flow lines and animated particle paths. EnSight 10.1.5.a is now available and includes threaded pathlines. A special thanks to our friends at Mentor Graphics for remembering their American cousins on July 4th with a Boston Tea Party themed simulation that resulted in the beautiful image shown below. 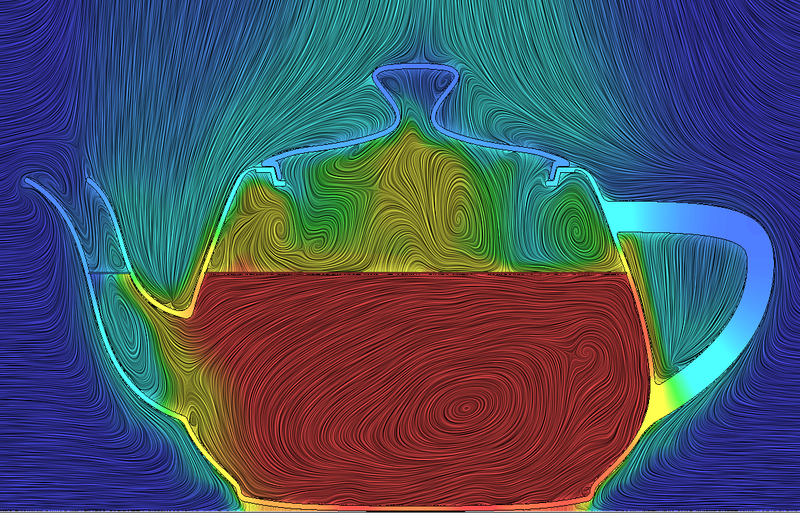 Streamlines in a teapot done with a line integral convolution method. Image from Mentor Graphics. See link above. The 5th Metacomp Symposium has been scheduled for 15-17 September 2015 in Pasadena. Abstracts for presentations are due 04 August. On a related note, Metacomp’s CFD++ is one of the solvers featured in Desktop Engineering’s article on Expanding the Search for CFD Solutions. The proceedings of the 6th Beta CAE International Conference are available online for you to download. On a related note, Beta CAE released ANSA v15.3.1. Screen capture from a CD-adapco simulation of a Hawker Hurricane water landing. [Feeds my love of WWII-era aircraft.] Click image for video. Not CFD, but a cool simulation of solar plasma nonetheless. Video by NCSA. Click image for video. SimScale is looking for the next #F1SimStar, i.e. the person who can make the most impressive visualization of airflow around a Formula-1 car. Deadline is “12.07.2015.” [As an American, I have no idea whether that’s December 7th or July 12th.] To support this contest they have posted three videos and other resources about simulations. TechClarity wants you to participate in their survey if you’ve recently changed or are planning to change CAD tools. You might win a $20 Amazon gift card. Is the STL file format on it’s way out? DEVELOP3D shares news about the 3MF Consortium‘s efforts to promote a modern file format for 3D printing and other apps. Did you know there is a mesh generation forum on ResearchGate? Artist Dan Cretu has embarked on a series of wood-carvings of bananas that feature a mesh motif. There’s a joke in here somewhere about “banana included for scale” but I’ll leave that to you. [Joke from SNL included intentionally.] You can find more of Cretu’s banana sculptures here. Correction: The artist informs me that the sculptures are not wood and that they are all rotten now. 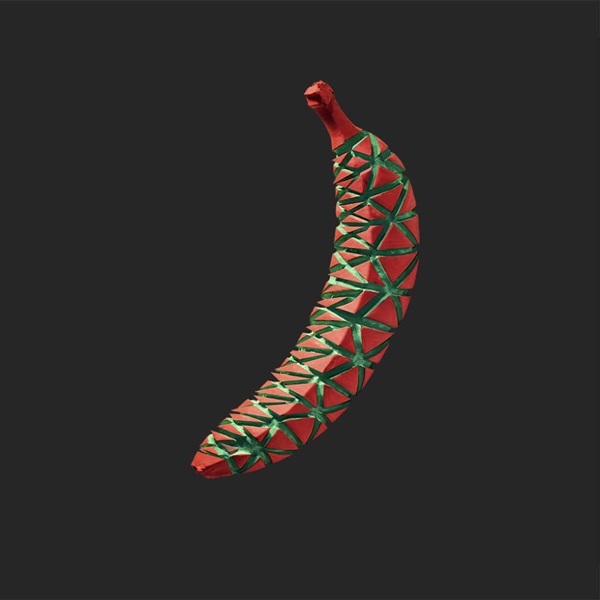 Dan Cretu, Bananametric, 2015. Image from That’s Nerdalicious. See link above. Bonus: From Monet to Riley, the role of geometry in abstract painting. As Mondrian said, he didn’t want to be limited to making mere imitations of the external world. This entry was posted in Applications, Events, Hardware, News, Software and tagged Beta CAE, CAD, EnSight, FIeldView, GrabCAD, IBM, Mentor Graphics, mesh generation, Metacomp Technologies, TechClarity, visualization. Bookmark the permalink.